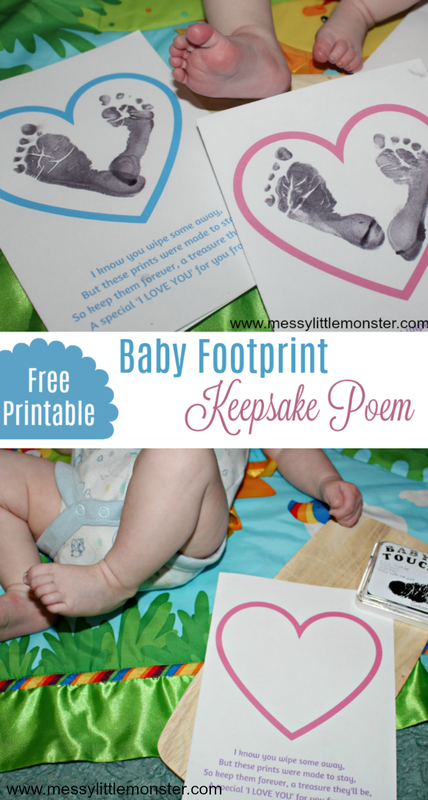 Baby Footprint Poems - 6 printable footprint quotes & poems! Baby footprints are so tiny and adorable! 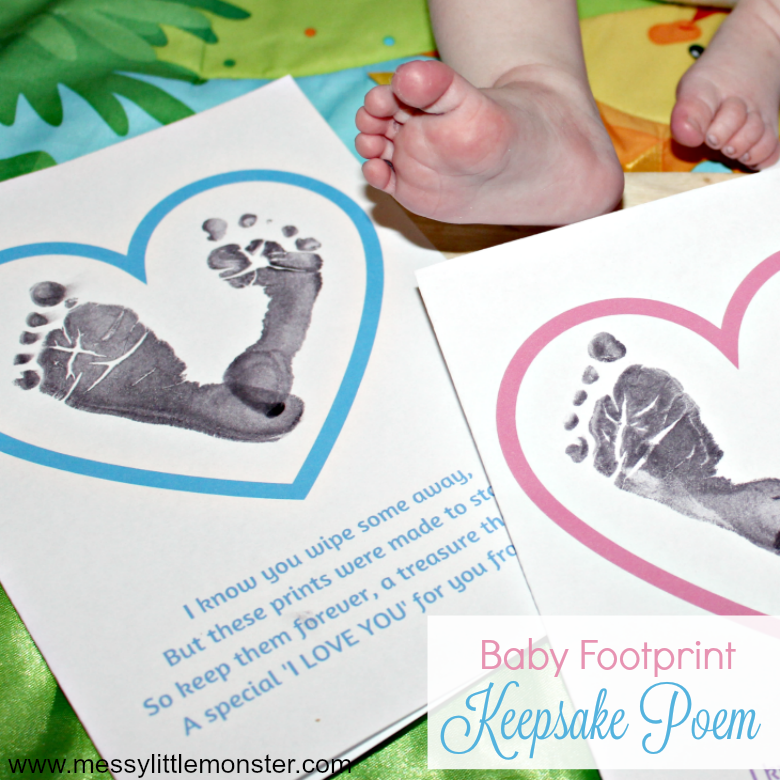 What better way to treasure your babies tiny footprints than to take some prints and display them alongside a baby footprint poem. We have a selection of 6 different free printable footprint poems and quotes to make creating this beautiful baby craft really easy. A keepsake poem next to little footprints would make a wonderful gift for mom for Mother's Day, Dad for Father's Day or as a personalised gift for grandparents, it would even be a fun Valentine's Day craft for babies to make! Ok, so there is no denying it, we love keepsake crafts! We have made so many over the years and I treasure them all. Kids grow sooo quickly, it nice to be able to hold onto a bit of their smallness! 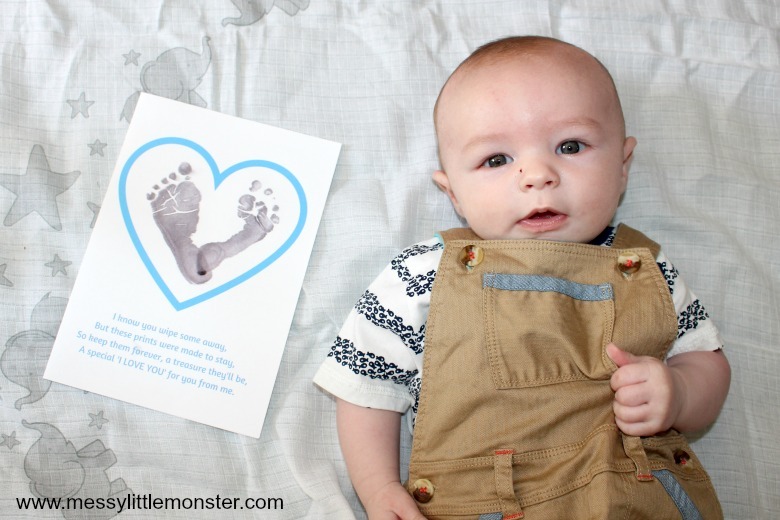 The baby craft that we are sharing today not only creates a beautiful footprint keepsake, we also have some of the most adorable footprint poems to go alongside those tiny footprints. We made this fingerprint craft using the same 'I know you wipe some away' poem. This poem would also work well using an older child's handprints. I first made this footprint craft when Oliver was only a few weeks old and his footprints look so tiny compared to his (almost) one year old feet! You can take baby footprints using paint, ink or an inkless handprint/ footprint kit. Personally I like using ink over paint for baby footprints as I find ink so much easier and a lot less messy! I think you get a better print too! Inkless wipes are also a good alternative. This isn't just a heart, as anyone can see. I made it with my feet, which are a part of me. Isn't it strange how quickly time goes? I love you from the top of my head to the tip of my toes. Little feet leave big imprints on our hearts. There is no sound quite so sweet as the pitter patter of baby feet. 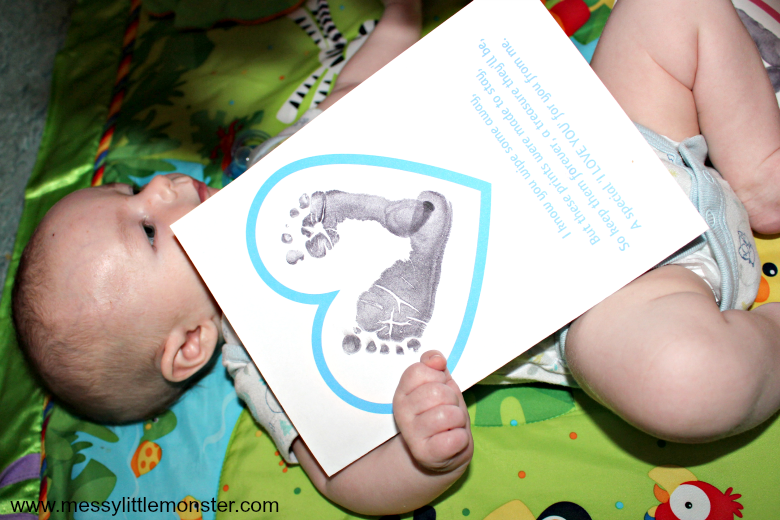 Baby Footprint Poem - An easy baby craft to treasure forever! You will also need a comfortable place for baby to lie down and a hard surface to put under the paper when you take a footprint (a book or board would work well). A packed of baby wipes nearby or a small bowl of water for the clean up would be handy too! It is always good to be organised, but it is extra important when doing crafts and activities with babies. Before getting your baby ready to start this footprint craft make sure you have your poem printed out, your ink ready and a hard surface to take the print on. STEP 2: Get baby ready! Timing it right is so important when doing baby crafts, the last thing you want is an upset baby! Make sure your baby is happy and comfortable before you begin (or for really tiny babies you could even do it when they are asleep!). I found lying Oliver under his baby gym worked really well as it gave him something to do whilst I prepared things. Until about 6 months old Oliver loved having his footprints taken, I think he liked the tickly feeling on his feet (and all the extra attention of course). As he has got older he isn't quite so keen as he just wants to keep moving! He will however come over to have his prints taken if the older children are doing theirs! Firmly (but not forcefully) hold your babies foot and press their foot into the ink pad (or paint). Make sure the foot is completely covered in ink and then press their foot into the heart shape above the footprint poem. Wiggle the foot a little to make sure you have printed the entire foot including all their tiny toes and then remove their foot. You will need 2 footprints to create the heart shape. I would recommend cleaning the first foot before taking the second print or you will end up with ink everywhere! Using baby wipes is the easiest way to clean up! I always like to make several keepsakes when doing baby crafts like this as some always turn out better than others. They make wonderful gifts for family members too. 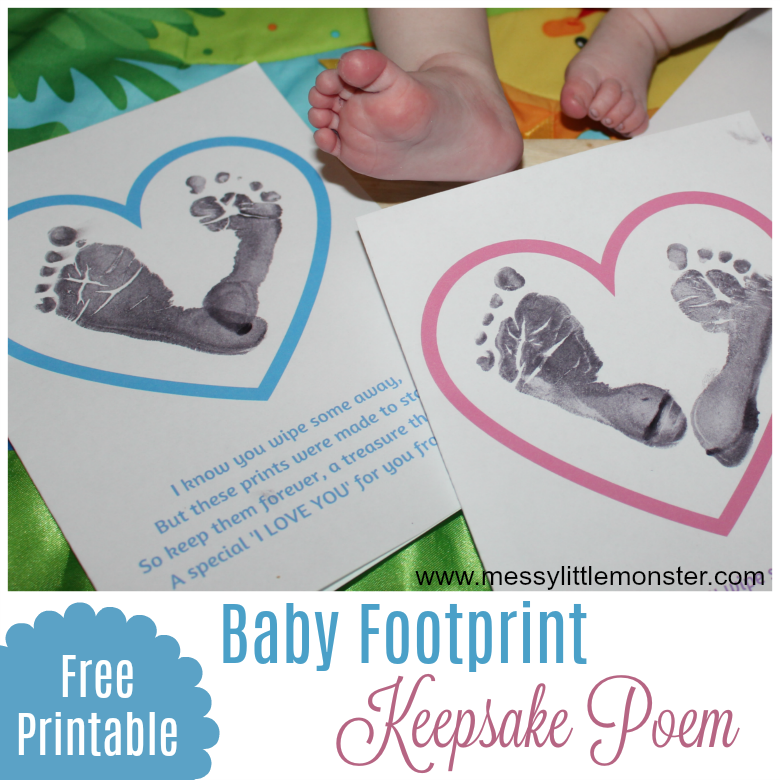 You can print this baby footprint poem onto paper but using cardstock makes it extra special, especially if you are giving it to someone as a homemade gift or card. To download this baby craft for free add $0 and click on the 'I want this' box below. It may take a moment for the page to load so please be patient. For personal use only. Not for redistribution. All images are copyrighted. Thank you. 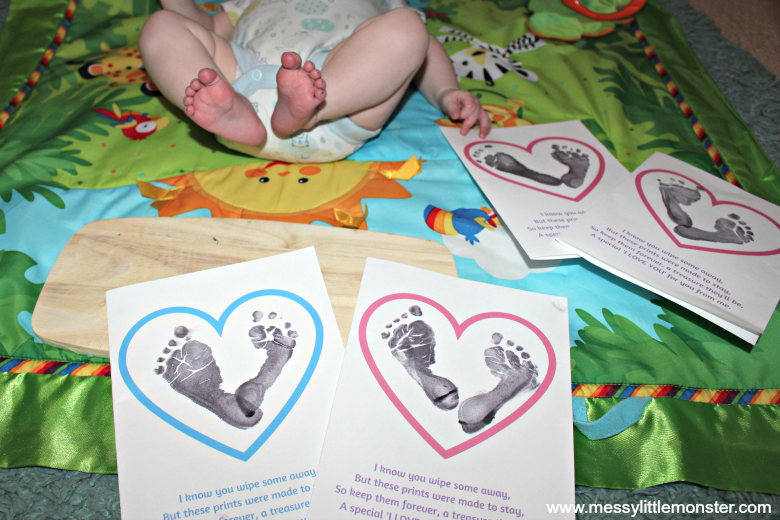 We hope that you enjoy making a baby keepsake to treaure forever using our printable baby footprint poems. Which of the 6 different baby footprint poems and baby footprint quotes will you choose! This is such an easy baby craft and it makes a lovely homemade gift or card. Follow us on Facebook, Pinterest, Twitter, Instagram or Youtube!